The view from my seat in Lambeau Field! Spectacular. Yesterday I realized a long time dream. 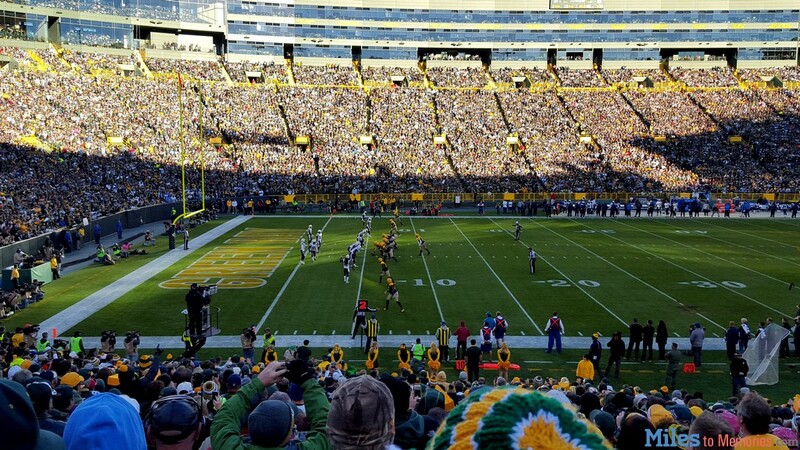 I finally was able to attend a Green Bay Packers game in Lambeau Field. Jasmine, Shawn Reece & I visited Lambeau Field way back in 2007 (and I wrote about it then), however that was just for a tour during the summer. Going for an actual game is a completely different experience. I started my day by walking up and down the rows and rows of people tailgating out by their cars. The atmosphere was among the most amazing I have ever seen at a sporting event. Even fans of the opposing Chargers were treated like family. Midwestern hospitality at its finest! Oh, and the food smelled divine! Eventually I came upon a booth for Associated Bank. Associated Bank is the “Official Bank” of the Green Bay Packers and they have a Packers checking/debit card product. I have actually known about this product for awhile, however I don’t just open bank accounts for nothing, even if they are Packers themed! Ya gots to pay me! Associated Bank has had a $150 bonus on the Packers account for awhile, which I learned about from Doctor of Credit. The bonus is available online, however they restrict the account to people who live in state’s where the bank is located (IL, MN, WI & VA). Fortunately that isn’t the case if you apply in-person! One set of tailgaters has this amazing converted school bus! While $150 is nice, the bank actually gives away even more goodies for applying at the game. In addition to the $150 bonus, they also were giving a $75 Packers Pro Shop gift card and I later found out that they were offering a Packers water bottle and blanket as well. It is only a soft credit inquiry based on people’s reports on Doctor of Credit. The account has a low initial funding requirement ($100) and they even let me fund with a credit card up to $500! To get the bonus I only need a $300 direct deposit or to pay 3 bills within 45 days! I get a Packers debit card! The bottle and blanket! Unexpected gifts since I didn’t find out about them until I was already applying. The process of applying was simple and took about 15 minutes. I was given my Packers Pro Shop $75 gift card on the spot along with the blanket and water bottle. The $150 should post within 75 days of completing the requirement, however people seem to be getting it much soon. There is an $11 monthly fee on the account, however it is waived with a $500 direct deposit. I’m not sure if I’ll keep it or not yet. There are actually many regional banks who will not let you sign-up for an account online, but will give you an account (and bonus) in-person. It is helpful to look for these opportunities while traveling. I wouldn’t have gone out of my way for this, but I was already there and I felt the bonus was worth enough to go for it. You can find state specific bonuses on the Doctor of Credit website (And there are a lot). Every once in awhile a nice bonus comes up that is state specific. If you are interested and will be traveling to an area with a good bonus, you could always call ahead to make sure they will allow out of state residents to open an account in-branch. In most cases they will. While I generally wouldn’t spend too much time on this, 15 minutes for $150 + $75 GC and goodies is a good trade I think. You might find something similar or even better. The MOST important thing is that the Packers won! I am really happy with my new checking account and feel that the bonus is worth the 15 minutes it took me to open it. I also got the side benefit of $500 in MS, which equates to 1,500 ThankYou points in my situation. If you are interested in checking account bonuses, then it never hurts to see what is available in your area and what you can find during your travels! For me, the checking account bonus was only the beginning of the good news. My first game at Lambeau was an exciting one. It ended with the Packers stopping the Chargers from going into the end zone to tie the game. The Packers won, I have my Packers debit card and had one amazing time. And the bonus ALMOST pays for my ticket. ALMOST. Previous articleThe Manufactured Spend Roller Coaster Ride: Advice You Need to Hear! But does the debit card earn 5x on cheese? Which Citi card earns 3x on bank loads? Is that part of a retention or limited special offer? Yes I was. Thanks PDX! Go pack go! Glad you got to make it to a game! Best experience in all of sports! Didnt know you are a packers fan. Just curious on 2 things. How long do you hold on to banks after a deal like this. I’m eying an awesome promo by BOA. Also when you load at a bank like this with your CC how do you know it won’t be a CA? I’m guessing changing CA to $0? Thanks again for your website and comments! Doctor of Credit keeps data points on which banks and cards count as a cash advance. I also set my cash advance limit to $0 as well. That is always a good deal. As for how long to keep the account, that is a personal choice. I have never heard of anyone having problems for closing an account too soon, but I suppose that is possible. I have two questions about this. I’m curious on how long do you usually keep bank accounts open that you’re not looking to keep, because there’s a lucrative BOA offer that I’m eyeing. Also when you deposit using a CC, how do you know that it won’t be charged as a CA? Do you just make sure all your CCs have a 0 balance CA? Thanks for your time and your website! I read your emails everyday. Awesome, thanks for your reply and sorry for the double post. I didn’t think the first one went through since I did it on my phone. Thanks again!